Shopaholic will be out to convince trainer Danny O'Brien in the Listed Straight Six at Flemington that she is a genuine contender for next month's Group 1 Stradbroke Handicap. O'Brien is thrilled with the progress of the three-year-old filly who resumes from a let-up in Saturday's feature sprint down the straight after an impressive autumn campaign which included a victory over four-time Group One winner Mosheen. He said the Queensland Guineas (1600m) on June 2 and the Group 1 Stradbroke on June 9 were both options for Shopaholic ahead of the Group 1 Tattersall's Tiara for fillies and mares over 1400 metres at Eagle Farm on June 23. "I would love to run her in the Stradbroke," O'Brien said. He said Shopaholic had a similar profile to Absolut Glam who he trained as a three year-old filly four years ago when she was a luckless half-length fourth to Mr Baritone in the Stradbroke before winning the Tattersall's Tiara. "We went close in (the Stradbroke) with Absolut Glam a few years back (2008) and it's certainly a race three-year-old fillies have a reasonable record in," O'Brien said. 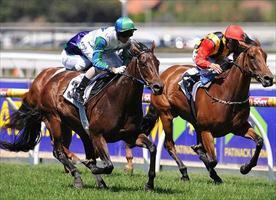 Recent fillies to win the feature include Dane Ripper (1997), Private Steer (2003) and La Montagna (2006). "This year we have got an unbelievable crop of three-year-old fillies that have been winning everything and this filly has got the right form line," O'Brien said. "In the autumn she won three of her four starts and was the only filly to beat Mosheen (in the Group Three Vanity at Flemington)." Shopaholic's only defeat last campaign was when she got "pole-axed" in the Kewney Stakes at Flemington at her last run on March 10. Since then Shopaholic has spent a lot of her time at O'Brien's Barwon Heads property where she had a couple of weeks of recovery and another two weeks of beach work. "I have been very happy with her," O'Brien said. "She has come on super." Shopaholic is among 25 entries for the Straight Six and she has just 0.5kg over the minimum with 54.5kg. Wangoom Handicap winner Second Effort and last year's Straight Six runner-up Perturbo, who will be ridden by Ben Melham, both have 60kg to head the weights.